The show starts with the governor sitting by a camp fire with his few men. He is a broken man. When he wakes up in the morning and climbs out of his tent he notes that the small crew he had left has abandoned him. 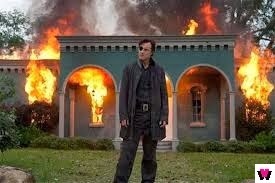 The governor goes back to his town and sets it on fire. You see the governor walking aimlessly. He has let his hair grow and has a beard. He ends up at a building and is taken in. He gives the name Brian and seeks shelter. The family talks to the governor and keep him up to date on how they survived. The old man asks the governor to retrieve an old backgammon set from one of the higher floors in the apartment building. The governor finds the backgammon set and a walker in the bathtub. The governor does find a gun while he is up there. He brings the game board. He appears fixated on the little girl. The governor tells them that a head shot is needed to kill the walkers. She asks the governor to go get a tank a oxygen from the old folks home for the sick old man. He makes the run and finds the old folks home filled with zombies. The governor finds a lot of oxygen tanks but finds himself overrun by zombies quickly. The governor is able to get two tanks. The governor gets to interact with the little girl, Megan. The governor teaches the girl how to play chess. She draws an eye patch on the King. The grandfather passed away. 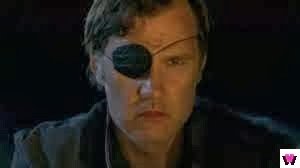 He turns and the governor has to kill him in front of everyone. Now the little girl is afraid of the governor. The governor burns the picture of his family. Lillie lets the governor know that if he leaves they are going with him. Lillie, Tara, and Megan are in the truck with the governor. They are on the road. Lillie and the governor hook up in the truck. They find themselves confronted by walkers and have to make a run for it. The governor and the little girl fall into a hole but he is able to kill the walkers in the hole quickly. They are found by the governor's old crew. Oh geez, this is one of those filler episodes. I cannot stand when a series have these throw away episodes that does not move the story line until the last 5 minutes of the show. The CW is good for pulling this move. 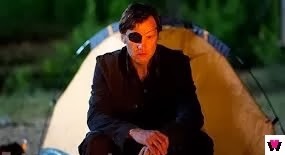 They could have summed up what the governor has been up to in 10 minutes not a whole show. It's good that we get to see his human side before he lost his mind. Yup, a whole episode and no story line is advanced.